Following years of outstanding mentorship of honors students, Department of Integrative Biology Professor Jaga Giebultowicz was named the Margaret and Thomas Meehan Honors College Eminent Mentor for 2018. This award recognizes one honors faculty member each year for their mentorship of honors students, particularly through the thesis process. Students and recent alumni can nominate their mentors, and a panel of past recipients selects the honoree. 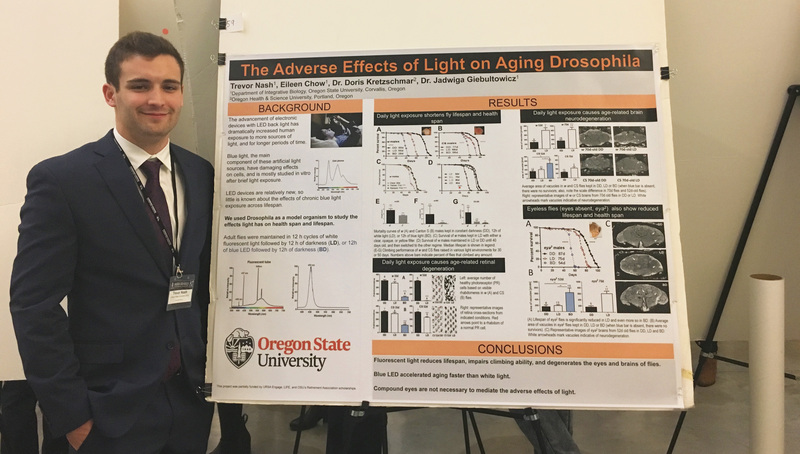 The Giebultowicz lab at Oregon State investigates biological clocks and clock disruptions by looking at tiny animals, Drosophila, or fruit flies. Students can experience the entire research process in Jaga’s lab because fruit flies only live for about 60 days. However, since more that 75% of human genes have their counterparts in the fruit fly, honors students working in her lab can still take away significant and far-reaching insights into the biology behind human health. Trevor Nash, a senior majoring in biology with minors in chemistry and psychology, has experienced this firsthand. He was testing what happens to fruit flies when they live their entire lives in the dark, expecting that fruit flies living in complete darkness would have shorter lifespans. Trevor Nash presenting at the Harvard Research Conference. College of Science Student Advisory Board. “Literally half of my resume is from things she’s encouraged,” Trevor says. “Beyond the lab, she’s just a fun person to be around.” Trevor says. Jaga knows everyone’s birthdays and has cake or celebrations for all the lab members’ special occasions. “I try to build their confidence even outside of research. In the lab, we’re like a family. They have a place to come study at night, and we chat as I come to prepare a lecture. They’re part of a group and feel they belong.” She continues to keep in touch with students she’s mentored over the years, even attending many of their weddings. And no matter what students go on to do in the future, she says, it is important to her to give them a strong foundation in research, which sets them up for success in many fields.